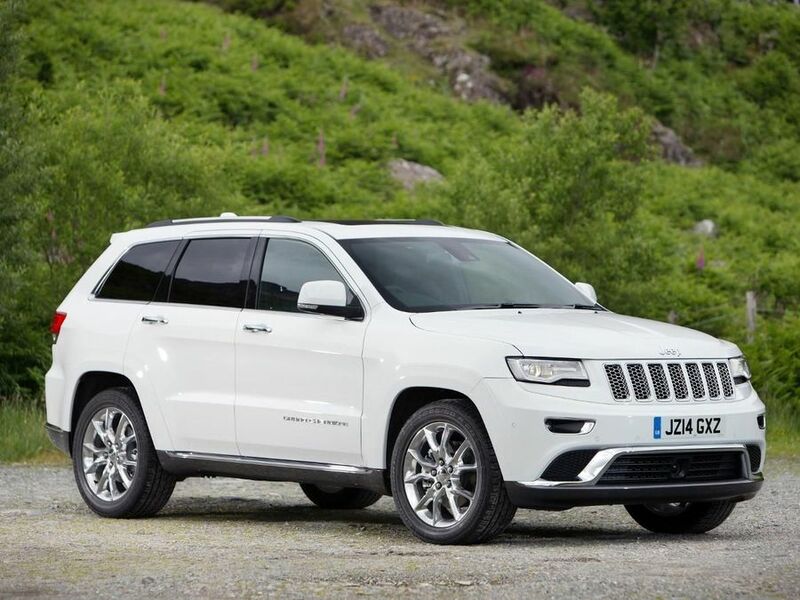 Read the Jeep Grand Cherokee 4x4 (2011 - 2014) car review by Auto Trader's motoring experts, covering price, specification, running costs, practicality, safety and how it drives. This Grand Cherokee is the best car Jeep has ever built. Well-built, handsome and great off-road, only vague handling lets it down. Interested in buying a Jeep Grand Cherokee? Despite its size and American origins, the new Jeep Grand Cherokee is one of the more understated large 4×4s on the market, although it retains the signature Jeep seven-slot grille and most models have chrome door handles. Bi-xenon headlamps and LED daytime running lights are standard, while Overland models and above get tacky 20-inch chrome alloy wheels, and the flagship Summit trim has larger body-coloured wheelarches and unique bumpers. Overall, the Grand Cherokee is less aggressive-looking than rivals such as the BMW X5 and Range Rover Sport, opting for a more subtle look like the Volkswagen Touareg. This will attract some, while others may find it a little bland. This is certainly a decent interior when compared to Jeeps of old, although it’s still not up to the high standards set by its German and British rivals, the gulf that once existed is shrinking. Touches such as the chrome-ringed dials and leather-trimmed dashboard on top Overland models add a touch of luxury, but some of more minor details (such as the smaller switchgear and more hidden-away trim) detract from the overall feel. Only the Laredo trim gets cloth seats, with each subsequent trim level getting a better grade of leather. Every version also gets an 8.4-inch central touch screen and a customisable 7-inch TFT display that sits between the main instruments. It’s possible to use these to control most of the Jeep’s functions, and the graphics and interface are attractive, if not especially intuitive. There’s plenty of room in the front, too, with an excellent range of adjustment on both the driver’s seat and steering wheel. The only issue some people may find is a lack of space for the driver to rest their left foot, because the pedal for the foot-operated parking brake gets in the way - a throwback to a much older era of car design. Although there’s plenty of room in the front, despite the Grand Cherokee’s size, it doesn’t feel quite as spacious as some rivals. Yes, you can get four adults inside, but if the driver is over six feet tall and has pushed the front seat right back, not only will another six-footer in the rear seat find their knees touching the back of the front seat, it’s also quite awkward just getting in and out of the back. The centre rear seat is a bit narrower than the outer two, but there’s still more than enough room for the Grand Cherokee to serve as a family car. The boot has a capacity of 782 litres with the rear seats up, but there’s no option for a third row of seats, so unlike a lot of its rivals, this is strictly a five-seater. On the other hand, folding the rear seats is a brilliantly simple, one-touch operation and liberates a commendable 1,554 litres of storage space, still a fair bit less than a Land Rover Discovery, or latest Volvo XC90. The only trouble is that the boot has a high floor, which can make loading and unloading awkward, but on Overland versions, at least the tailgate is automatic - although again, this is standard on every trim on some rival SUVS. Other than feeling rather firm and uncomfortable at low speeds, the Grand Cherokee generally rides well, particularly with the height-adjustable air suspension system fitted to top-spec models. Our only complaint is that it can feel very soft and floaty over bumps at higher speeds. Sadly, matters aren’t helped by the steering, which is light and has a lot of play at the straight-ahead position, making the car tricky to place accurately on the road, particularly on narrow country roads. For the same reason, the Jeep feels a little vague during fast cornering, and the BMW X5 and Range Rover Sport are more fun to drive, with better body control. At least the light steering helps at low speed, but the downside is that it’s low-geared, demanding a lot of turns on the wheel when manoeuvring. For a Jeep, though, the Grand Cherokee is surprisingly limited off-road. Despite a host of mechanical and electronic aids, unless you opt for the Overland and Summit models (which both have an electronic differential and air suspension) then the low ride height means it bottoms out over tricky ground, and the lack of proper differential locks mean it's best to keep the cheaper versions on Tarmac. However, top-spec versions, with a five-mode selectable all-wheel drive system, can handle almost anything you throw at them, from deep sand to rocky tracks and muddy fields, and all versions have all-terrain tyres as standard. Most models come with a 3.0 CRD diesel engine, which has 188bhp in the basic Laredo model, but 247bhp in every other model. An eight-speed automatic transmission is standard across the range, and while it makes the car slightly sluggish pulling away from rest, it’s nice and smooth once you’re up and running. With the ‘box slurring its way neatly from one ratio to the next, performance is fairly swift, and the car responds quickly when you put your foot down for such a big, heavy beast. At the other end of the spectrum, to improve the car’s off-road ability, a low-ratio set of gears is also standard. However, the engine is noisy and intrusive under heavy acceleration, and no match for the latest generation of engines from BMW and Audi. If fuel economy really isn’t a concern, you can order the 6.4-litre Hemi V8 SRT model, tuned (very effectively, too) for sports car acceleration – 0 to 62mph in 5 seconds and on to a rude 159mph top speed. The Grand Cherokee is considerably cheaper than similarly-sized European rivals, only being undercut on price by the Kia Sorento and Hyudai Santa Fe. It will lose considerably more of its value over three years than the German models, however, and once you add on a few extras and choose a more appropriate trim, the price rises to well over the £40,000 mark. The diesel’s 198g/km CO2 emissions are not especially competitive though, neither is its 37.7mpg fuel economy. A Land Rover Discovery is equally polluting, but the BMW X5, Volvo XC90, and Audi Q7 are all considerably more efficient, and cheaper to tax. Jeeps are renowned for their ruggedness but aren’t as highly-rated in customer satisfaction surveys as some rivals. However, with such an obvious focus on improving the build quality of its latest cars, the Grand Cherokee has the potential to rewrite its reputation. With no recalls for the current model, and few reports on our own website of any common issues or faults with the latest model, it looks to be succeeding, in changing these perceptions. All Grand Cherokees are well equipped, with a touch-screen infotainment system and dual-zone climate control as standard, and all but the Laredo model featuring leather upholstery and heated front seats. The range-topping Summit is fitted with every extra including electric, heated seats, wood trim, 20-inch polished alloy wheels and parking cameras. The SRT version has also has 20-inch alloys, but of a different design, as well as a body kit and carbon fibre trim. Basically, as soon as you move up the range the Jeep will offer you more standard kit and extras than its premium rivals, most of whom will ask you to shell out more for the sort of goodies that Jeep will throw in as standard. The Grand Cherokee has handsome, understated looks, while its good value for money, all-American image and decent off-road ability will appeal to many - just ensure you go for the right version, as some models drive, ride and feel a lot better than others in the line-up.